I adore romances set during Medieval times and, in my opinion, Kris Kennedy is one of the best authors writing in this period. Earlier this month, Kennedy released her newest book, Claiming Her which went straight to my keeper collection after reading it...twice. I have no doubt I'll be revisiting this story again and again in years to come. 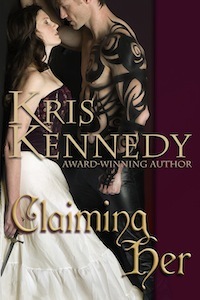 Claiming Her is currently only $2.99 in e-book format but is worth its weight in gold. It has my highest recommendation! Five years ago, Kennedy published another book that also has a place of honor on my keeper shelf. Today, she's releasing a revised edition of that story along with a brand new cover. Following is my 2011 review of Defiant by Kris Kennedy. The updated version landed on my Kindle this morning and I can't wait to return to Medieval England for another visit with these unforgettable characters. During the tumultuous reign of King John, when civil unrest brewed and loyalties were constantly called into question, a hard, powerful knight and a beautiful young woman stalk the same quarry…for very different reasons. Jamie Lost, chief lieutenant of King John is sent to capture a priest who has returned to England after fleeing ten years earlier when he witnessed events that, should he talk, could mean the end of King John’s reign. Eva also fled the country ten years ago and has spent that time hiding in France, protecting the young boy she rescued and spirited out of England following the murder of his father by King John. She is after the same priest as well but her purpose is to rescue her dear friend, the man who saved her life all those years ago. Jamie is a hard man; tested by battle, betrayal and years of living on the streets of London as a child. He has no family, only his friend, Ry who travels with him, and banned love and affection from his heart long ago. Worst of all, to Eva’s mind, he is loyal to King John, a man to be avoided at all costs...but must he be so appealing? Even a feared, ruthless mercenary, a Brabançon, identified himself with someone. Usually the English king. By the look in this one’s eye, ‘twas a simple enough matter to place him there. But somehow, she couldn’t believe something so…beautiful could be so awful. And he was beautiful indeed, to a hard line, a masculine magnificence, all long, lean contours of hard heat and piercing eyes. A beast in his prime. A natural-born caretaker, fighting fiercely to protect the people she loves - Father Peter and 15-year-old Roger, the child she rescued all those years ago – the child that is the missing heir to a powerful English title, information that will put his life at risk should it come to the attention of King John or his chief lieutenant, it’s a given that Eva and Jamie would be natural adversaries. Jamie, of course, is a trained warrior but Eva is a warrior at heart, a fact you would never guess by looking at her and one that causes Jamie no small amount of frustration. Totally unexpected, however, is the instant attraction between the two, not that either has the inclination to act upon it…at first. When the barriers are finally lowered though, and a tentative trust begins to develop, will the man who thinks he has no room for love in his heart and the woman whose fondest dream is a cottage by a river and a family to care for discover a love for the ages? Or, will secrets, betrayals and an unstable king slash their hopes and dreams to shreds? Kris Kennedy has once again written an unique and emotional love story, filled with passion and adventure and rich in historical detail. She has a way of writing that draws me into the story so that, rather than reading about characters and events, I feel as if I’ve been transported back in time and am experiencing their adventures alongside them, such as in this passage when Eva rides through the English countryside for the first time in ten years. Eva felt as if she were riding through the middle of one of Father Peter's sketches. The trees all wore billowing green caps and stood proudly in their dark brown tunics as they marched up and down the hills of England. Less showy, but more sweet, tiny pricking flowers hurried to the edge of the track. The hedgerows hosted a profusion of flowering vines and exhuberant birds, flitting their wings and chirping. Whenever the land opened up, herds of red poppies raced down the hills like ponies, all exhuberance and flicking tails. Jamie and Eva are complex, multi-layered characters who Kennedy very skillfully reveals to us, one layer at a time, throughout the book. It's the layers, the flaws and conflicts, not only between them but within each of them, that infuses them with the realism that makes them such fascinating characters. There’s an equally interesting secondary cast (primarily Roger, Ry and Angus, the one-eyed Scotsman) whose contributions to the story move the plot along, inject humorous moments and provide insights into the hearts and minds of our hero and heroine. I have hopes that we might see some of them in a future book, perhaps one with young Roger as the hero. I so want to read the rest of his story! 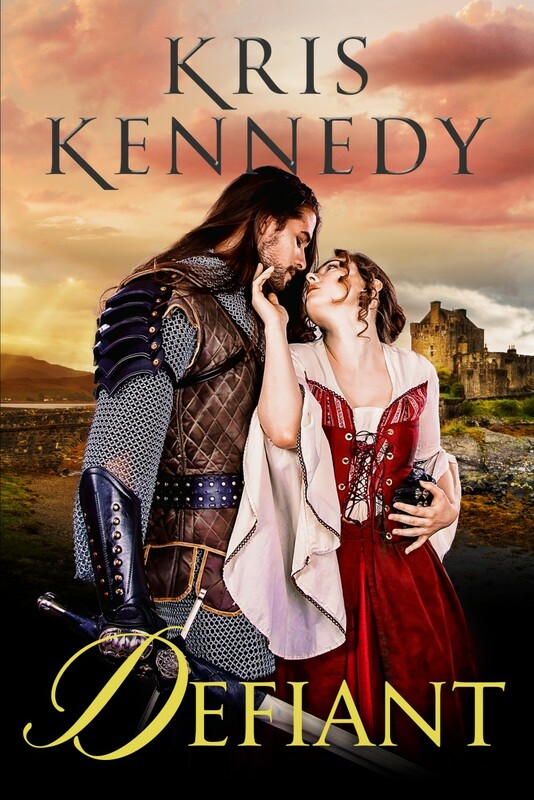 Defiant has joined Ms. Kennedy's other two medieval romances on my keeper shelf where it will no doubt be revisited from time to time. Writing as good as this never goes out of style. Do you have any favorite books set in this period or favorite authors writing in this era? Have you read any of Kris Kennedy's books yet? Do you have a favorite? Because I love these books so much, I'm giving away a Kindle copy of Defiant or Claiming Her (winner's choice) to two randomly chosen people who leave a comment on today's post. Deadline for entering the giveaway is 11:00 PM (EST), May 26, 2016. Lady Katarina has safeguarded the Irish barony of Rardove for the queen of England with audacity and sheer will, bending to no man. But when the worst of the Irish warlords breaches the impenetrable castle walls through trickery, he threatens her personal wall of cool reserve as well. Aodh Mac Con the most formidable man she's ever met, but the deeper danger of this Irish scoundrel is that only Aodh can see—and appreciate—the deepest, most hidden parts of her. Only Aodh can unleash her secret passions. Can she stand firm, or will she fall too--straight into his arms? Aodh Mac Con, The Hound, is through serving the English Crown and waiting to be granted the barony he sees as his birthright. After taking control of the remote castle with his bold men, he turns his attention on Katarina, intending to conquer the cool, reserved chatelaine as he's done everything else in his life: by making her bend to his irresistible will. Can he conquer her in time, before the armies of England come marching, or will the fire that fuels her defiance put everything he's fought for in peril? Jamie Lost is King John's most renowned commander, an audacious knight ordered to kidnap a rebel troublemaker before enemy forces close in. The mission is simple—until he comes up against a beautiful, mysterious woman who first threatens his mission, then his cold, black heart. Eva is determined to find the 'troublemaker' too, and protect the dangerous secrets he holds, even if it costs her life. Danger lies everywhere, especially in the blue-eyed knight showing far too much interest in her activities. But deep inside, Eva knows the real danger lies not in the weapons crisscrossing Jamie's body, but in the desire he awakens in her body & her heart. When a mysterious band of armed mercenaries upends both their plans and abducts their quarry, Jamie and Eva must form an uneasy alliance. As civil war erupts around them, they embark on an epic journey that betrays the truth about their identities and their unexpected loyalties, and unleashes an explosive passion that will seal their fates—and the fate of England—forever. I have read her books and loved them. Since it's my favorite genre I could name quite a few authors but my top two are Kathleen Woodiwiss (who got me hooked on romance) and Julie Garwood. Do you know, I've never read a Kathleen Woodiwiss book? I know. I need to correct that one of these days. I love Julie Garwood's Medieval romances. Kris is one of those authors that grab my soul with their writing. LOVE her work! What a lovely description and so true! I'm not a big fan of Medievals, but I am a big fan of Kris Kennedy. I remember I first read The Conqueror after Manda Collins recommended it and promised I'd like it despite my lack of fondness for Medievals. Manda was right, and I've been reading Kris Kennedy ever since. I love her characters. The Irish Warrior is my favorite. Claiming Her is on my Kindle, but I'm on deadline for a freelance assignment and haven't had a chance to read it yet. Medievals by other authors that have a place on my keeper shelves include Jo Beverley's Lord of Midnight, Teresa Medeiros's Charming the Prince, and Mary Jo Putney's Uncommon Vows. I rather like a good Viking romance. The Vikings were active in the British Isles, particularly in Northumberland but also in Ireland. Somehow stripping away the veneer of advanced civilisation to reach the raw emotions and survival instincts of these primitive societies excites something deep down and primitive in the psyche. Julia Knight's 'The Viking's Sacrifice' is a good one and the audio narrated by Amanda Cobb is outstanding. I would also recommend Erin Riley's 'Odin's Shadow' as a good example of Viking activity in Ireland and the romantic effects of mixing cultures. Afraid I haven't read any of Kris Kennedy's work but a high PJ rating definitely adds it to my list of authors to try! I actually haven't read a good medieval romance since I discovered Elizabeth Lowell's Disputed Lands trilogy about 10 years ago. They were angsty and dramatic and I loved them. Another oldie but goodie is Heather Graham's Viking trilogy. *that* was some classic 80's/90's love/hate/force-seduction/fall-in-love romance drama right there! Definitely going to have to go check this author just for nostalgia sake :) Thanks for sharing! Julie Garwood has written several of my favorite Medievals. Other favorites have been Kingdom of Dreams by Judith McNaught and The Warlord by Elizabeth Elliott. I love medievals! Some of my favorite authors are Amy Jarecki, Gina Conkle, and Tarah Scott. I love Medieval romances. It's the age of chivalry after all. Adding to my reading list thank you. I do love Medieval romances--there aren't enough of them! Sadly, I haven't read any of Ms Kennedy's books yet. I haven't had the pleasure of reading any of Kris' books yet. I do love Medieval romances. Some of my favorite authors are Suzan Tisdale, Sue-Ellen Welfonder, and Tarah Scott. Sorry I am so late. Medieval romances were the first I read and are a favorite. Although I haven't read many lately, I thoroughly enjoy them. When I discovered romance, it was through Julie Garwood's historicals. THE PRIZE was the first and I hunted every other one down as soon as I could. We are lucky there are so many good authors writing medieval stories.